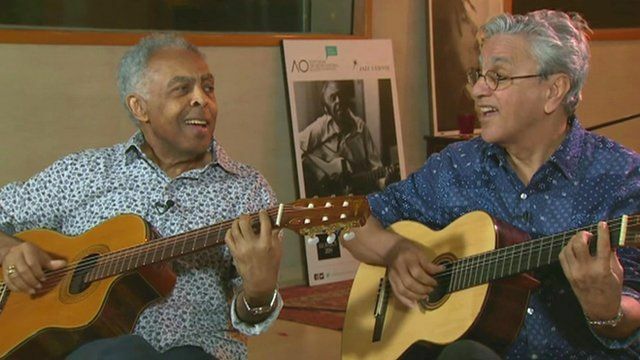 Brazilian music stars back together Jump to media player Stars of the Brazilian music scene Caetano Veloso and Gilberto Gil talk and play together. Brazilian stars sing together Jump to media player Brazil's Caetano Veloso and Gilberto Gil perform Nine Out of Ten for the BBC. Gilberto Gil on politics and football Jump to media player Newsnight's Stephen Smith talks to the Brazilian musician, campaigner and former Minister of Culture, Gilberto Gil, about riots, politics and the Pope's recent visit. LatAm Beats: Lucas Santtana Jump to media player Rising star and genre bender Lucas Santtana is one of the most prolific and internationally acclaimed Brazilian singers and composers. Brazilian music would not have developed as it did over the past decades if it hadn't been for Caetano Veloso and Gilberto Gil, two of the country's most important musicians. They were central figures of the Tropicalia movement in the late 1960s, which revolutionised Brazilian music by embracing foreign influences and experimenting with different styles. Now aged 72, they are getting together to tour Europe to celebrate 50 years of their careers. Two Friends, One Century of Music is their first tour together since 1994, and has its debut in Amsterdam on June 25. Julia Carneiro met with both artists in Rio de Janeiro and had a taste of what's to come. Caetano Veloso (on the right) and Gilberto Gil (left) are performing Nine Out of Ten by Caetano Veloso.